For those of us that remember Hurricane Katrina and how it destroyed areas of Louisiana with flooding and devastation, we all had hoped that our country would learn to be better prepared for these natural disasters, especially in response. Sure, hurricanes are unpredictable, we can accept that. But as we learned this summer, after our southern states and territories have been pounded by three major hurricanes, we were still not prepared for proper response after the Hurricane Harvey hit Texas, resources dramatically thinned as Irma crashed into Florida, and now, the US territory of Puerto Rico, residents are US citizens, are impacted by governmental red tape, as well as the impact of FEMA being inadequately staffed and insufficiently budgeted, the effects now show. I will be honest, I do not know what the budget for FEMA actually amounts to, and if there is actually a budget for so many natural disasters a year. But clearly, vacancies in FEMA that still exist, reductions in funding, are leaving our country unable to respond in the event of an unprecedented season of multiple national disasters. I cannot speak for Houston. It seems like news coverage is now focused on Puerto Rico. I intentionally did not say “rightfully so,” because after seeing the devastating flooding, and living in the hurricane zone of Irma, southern Florida, I know we are still cleaning up and are told, cleanup could take another 4 to 6 months. While we had some flooding, it was nothing compared to Houston. But as the media is concentrated on Puerto Rico, they truly are on an “island in the middle of nowhere,” which makes it hard to get help and relief. Until this morning, a shipping restriction, called the “Jones Act,” restricted any non-US ships from carrying cargo into the ports of Puerto Rico. This was preventing the massive amounts of aid needed for those in Puerto Rico. My own opinion, I am still baffled by some of the restrictive decisions made by FEMA restricting air traffic in and out of Puerto Rico to either evacuate US citizens, or deliver aid. So, what can we as individuals do to help? Well, as Pitbull, Mark Cuban, and other notables are demonstrating, they are making a difference with the resources they have. Obviously, they can afford to send their own private planes and offer other assistance. But you do not need a million dollars to help. I am certain you must be aware of hurricane victims getting ice and water distributed to them after a disaster like we have gone through. 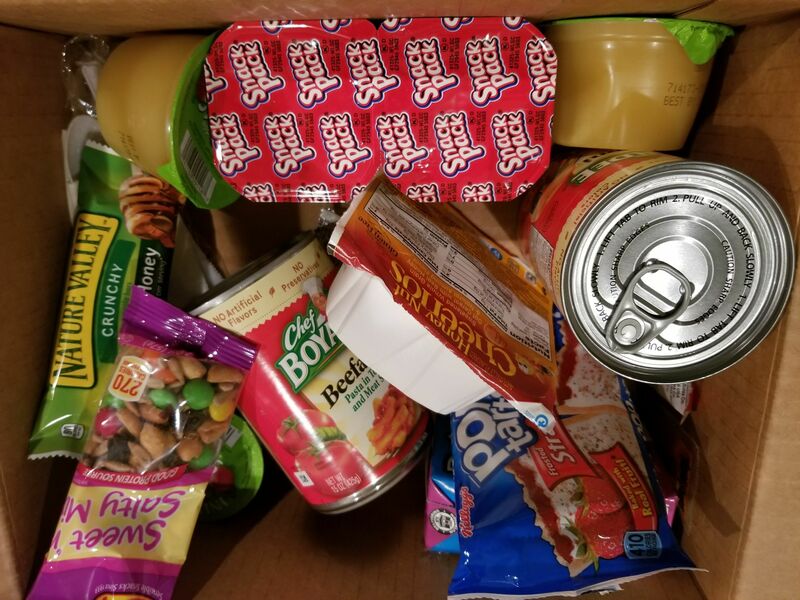 This picture is the contents of a box prepared by a contractor for FEMA, which basically will feed an individual for a day, three meals and snack. Not too sure how good the container of milk is, but it is stated that it was prepared to be stored at room temperature. But boxes like this, are handed out at distribution sights. Following disasters like this, many concerned people look for ways to help. We are always encouraged to donate to the Red Cross. But the one drawback to me, someone who wants to make a difference now, following Katrina, there was a likelihood that anything donated for Katrina, would not go to Katrina victims, but most likely stored in a warehouse for the next disaster. What difference should it make who it helps as long as we help, right? Puerto Rico is in horrible shape. They need help now. There is no time to wait for the government to follow steps and procedures and other bureaucratic red tape. I felt the same way when Katrina hit. Which is what this food kit reminded me of. Years ago, I ran a youth group, and yes, it was during the days of Hurricane Katrina. And the kids wanted to help. Together, we all created “shoe box kits,” which not only had some non-perishable foods and water, but also supplies such as toothbrush, toothpaste, toilet paper, even some small games like cards to distract or toys for children who might be scared. More importantly, the kids all wrote a letter to go inside the box letting the recipient know that they were not being forgotten. And it was hoped that the box would give them hope. Instead of sending these boxes to the Red Cross, we sent them to a church outside of New Orleans, directly to a minister, and asked if they had any kind of drive to help the Katrina victims, to make sure that these disaster kits were given out. And they were. We actually heard back, not just from the minister, but some recipients as well. I could never have been more proud of these kids for taking the initiative to help other more than a thousand miles away. We were not as famous as Pitbull or Cuban, but all of our acts show that one person, or a group of people, can make a difference, especially when response by official organizations may be perceived to be either slow or ineffective. You can make a difference.